Gaius Pius Esuvius Tetricus was Emperor of the Gallic Empire (Imperium Galliarum), reigning 271-274, succeeding the murdered Victorinus and ending with his surrender on the battlefield to the Roman emperor Aurelian. 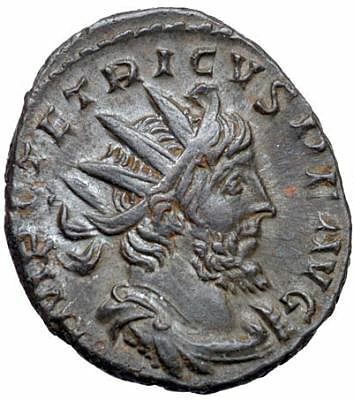 Tetricus, who ruled with his son, Tetricus II, was the last of the Gallic emperors. According to literary sources, after being displayed as trophies at Aurelian's triumph in Rome, the lives of Tetricus and his son were spared, and Tetricus was even given the title of governor of a southern region of Italia. Tetricus died at an unknown date in Italy, and is listed as one of Rome's Thirty Tyrants in the Historia Augusta. Reverse: PAX AVG, Pax standing, holds olive branch and long vertical scepter.